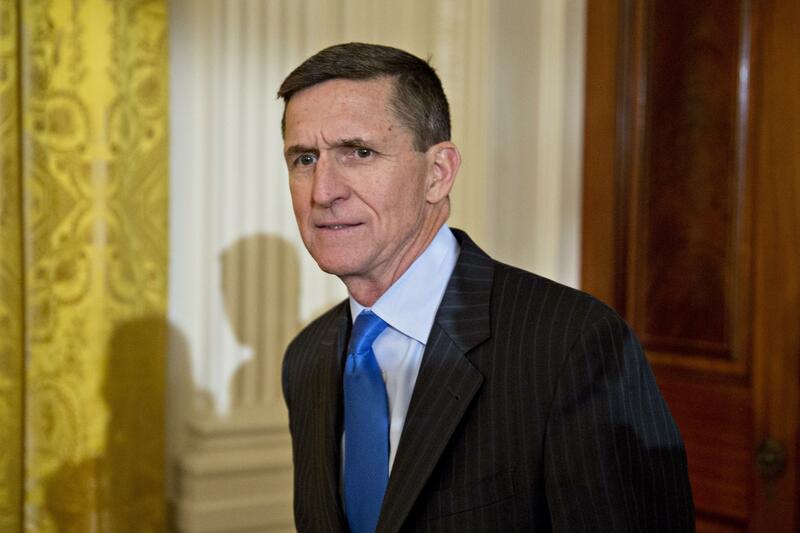 Former National Security Adviser Michael Flynn turned over about 600 pages of documents Tuesday to the Senate intelligence committee as part of its investigation into Russia's meddling in the 2016 presidential election, according to a congressional aide. The aide said the committee's investigators immediately began reviewing the information to determine the extent of what Flynn provided. The aide spoke on condition of anonymity to discuss the committee's sensitive work. "We can't make any judgment on whether he's fully complied because we've got to review the documents," Warner said. The documents came as Homeland Security Secretary John Kelly indicated that President Donald Trump's son-in-law and top adviser Jared Kushner and his communications with Russia are part of a wide-ranging probe by the Justice Department's special counsel. Meanwhile, a Democratic lawmaker called on a top Justice Department official to clarify the scope of Special Counsel Robert Mueller's investigation. On Tuesday, committee chairman Sen. Richard Burr, R-N.C., said the panel sought Flynn's business records — including travel, expense and phone records — to determine whether those records "would give us insight as to where he was when he was, what reimbursements he received, what expenses he might have had." Burr said it was still possible Flynn may turn over more records. He noted the committee is still working with Flynn to see if he will agree to be interviewed as part of the panel's probe. In addition to the Senate panel, Flynn is under investigation by other congressional committees as well the special counsel over his contacts with Russia. Among those contacts under scrutiny is a December meeting between Flynn, Kushner and Sergey Kislyak, Russia's ambassador to the U.S.
On Tuesday, Kelly defended Kushner at a Senate hearing amid reports that he attempted to establish "back-channel" communication between Russia and Trump's presidential transition team. "We have to make the assumption — and I will — that Jared Kushner is a great American," he said. Pressed by Montana Sen. Jon Tester, a Democrat, on whether he believes lawmakers should "ensure that assumption is correct," Kelly described the questions as part of Mueller's scope of inquiry. "I think there are numerous investigations that are looking into this," Kelly said. "I think it's part of the Bob Mueller investigation, and I think there's a number of congressional committees looking into it." The full scope of Mueller's investigation into possible ties between Mr. Trump's campaign and Russia remains unclear. But it has incorporated a separate criminal investigation — which predated the election — of former Trump campaign chairman Paul Manafort, The Associated Press reported last week . Also Tuesday, a senior Democrat on the House Judiciary Committee wrote Deputy Attorney General Rod Rosenstein to clarify the scope and authority of Mueller's role and asked Rosenstein to ensure the probe is free of political interference. "It is of paramount importance that Mr. Mueller's investigation proceed, unimpeded by any officials who may have a conflict of interest or other ethical bar, or by political interference of any kind," wrote Rep. Jerrold Nadler, D-N.Y.
Rosenstein acknowledged Friday there's a chance his role in the firing of FBI Director James Comey could become part of the special counsel's investigation. If that happens, he said, he will recuse himself from being Mueller's point of contact on the probe. "If there's a need from me to recuse, I will," Rosenstein told The AP. He also said the scope of Mueller's probe is broad and could encompass any number of actions.